Boots/socks to protect new puppy (8w) when outside? I was considering getting socks (just $4, so no big investment) for when I get my puppy. I want him to be getting leash training, exercise, and socialization during that first month I have him (as well as after). People on here have said they carry baby wipes. I was thinking if I used the socks, maybe that would protect his feet more so I wouldn't have to worry about him stepping in parvo-poop on the sidewalk or just something small. I'll also be sure to avoid high-dog areas, no parks, only vaccinated puppy play, and avoid all dog poop, but I thought the socks could offer some extra protection. I really don't want him getting sick, but I don't want to sacrifice a month of outside training and socialization! I was also thinking I could wash them normally, since they are really just socks with a hard-ish bottom on them, so it would wash away the ick. Plus, I would like him to be able to wear boots in the future (as I'll be taking lots of snow trips with him! 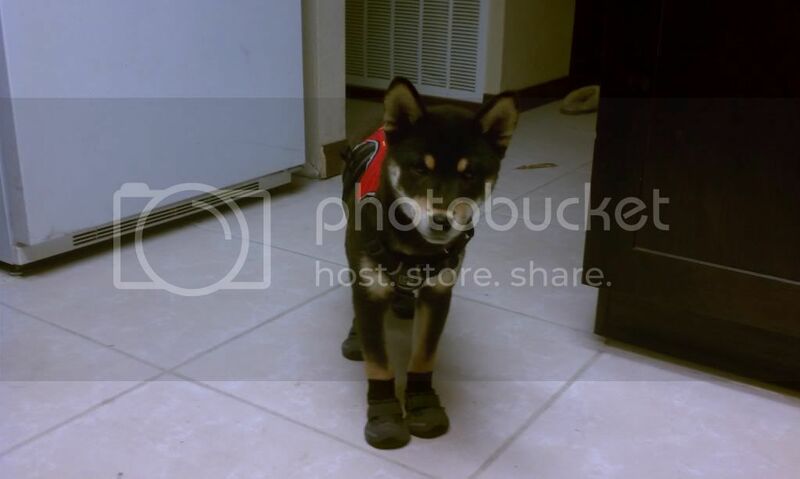 ), I figured if he wears something a little less constricting now, he would be a little used to the 'shoe' feeling so he might not become a statue when I put boots on him later (as I have heard many Shibas become when subjected to the evil boots :P). What do you Shiba-experienced think? Oops, I guess this could go under Puppy Woes. I was thinking because it was boot advice it went here. Sorry! I dunno. I personally think that's going overboard. As far as him getting used to them, and treating him when he wears them inside, sure, that's great. I probably should've done that because Sagan has never worn booties or socks in his life. However, I think his paws are just fine as they are, and if I really think he'll hurt himself or have paranoia around a specific area, I'd pick him up. In general Shibas are very sensitive about their paws and need much training so you can hold them, wipe them, trim the claws and personally I'd feel that's enough for the puppy. As for disease control measure I'm not sure socks would be enough anyways, puppies tend to put lots of things in their mouths too for example, but parvo hardly exist in my country so I don't know much about it. For the snow plans I can at least vouch for that boots are not needed. Shibas do just fine without. There are paw creams you can buy that protect them if needed. I think the motive is good but I'm not sure socks will protect much from parvo. You'll have issues trying to keep them on, among other things. My dogs seem to get their front paws wet a lot of times when they pee, from not lifting and also from the overflow. How are you going to keep your puppy from licking anything that might be infected? Not that it can't be possible, but I doubt your shiba will take to boots. Thousands of years of evolution have protected them from the variances in weather and the boots on the market have only been around maybe thirty years or so. We've had single digit temperatures and lots of snow in my area and my shibas have never been adversely affected. If anything the colder temperatures seem to amp up their energy. I've seen boots on some dogs at our park, and it just seems like more of a hassle than they are worth. They're never designed well enough to be really reliable. I've seen a product of "disposable rubber booties" that look like balloons. That might be a better option, but even those seem a bit much. It sounds like if you're planning on avoiding high trafficked dog areas during your puppy's first few months that should be enough to eliminate any risk of contracting parvo. Particularly in that first month, your shiba will be doing a lot of sleeping. Their energy and play comes in short bursts. You probably won't get beyond a few hundred feet when it comes to leash training. There's a product called Musher's Secret which is like a wax that you can put on their paws as a protectant against chemicals and temperature extremes. From the name you can guess that it's used by folk's who have sled dogs. There are other similar products too that you may find at your local boutique dog store if you can't find the MS brand. 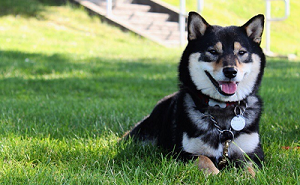 I'd investigate those products before trying to get your shiba used to boots, I mean what if your shiba gets too dependent on them and then you can't take him out unless their on. Good luck finding and putting those on in the middle of the night. Ugh! 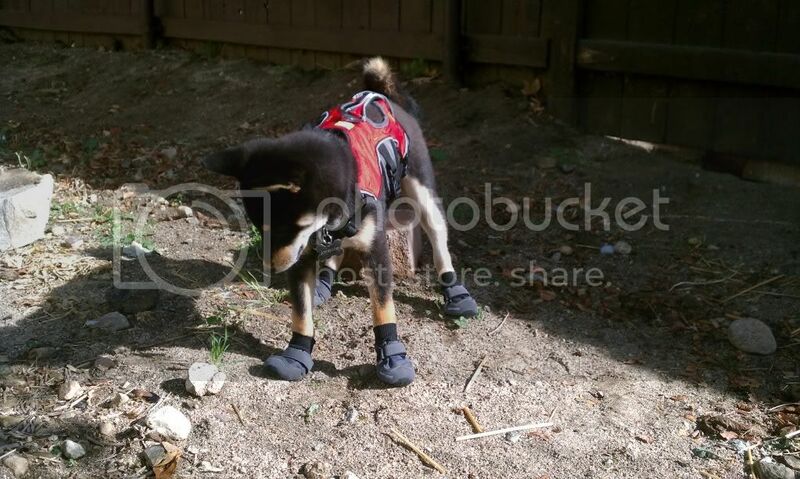 Put boots on my Shiba when he was at his itchiest to try and keep him from scratching his face. It took him less than 10 seconds to pull them off. Other than that we have never tried or needed boots. I frankly think they're more trouble than they're worth. I would suggest puppy slings and carrying for bringing a puppy places. As for leash training, no reason that can't begin in the house and then move outside when all the vaccinations are done. Alternatively, if you're in a low disease area you might not even need to bother being as careful as all that. We were in an area where parvo was uncommon enough that our vet wasn't worried about us taking our puppy for walks, etc. I got my little one use to boots when he was very young. It was mainly because in snow areas they would poor salt on the ground to melt the ice and the salt will dry and crack the paws of any dog or even your feet. I had luck with the rubber balloon shoes. They were the only ones I had success with. They stay on well, though I only use them in winter. In the summer I just wipe his feet, its a lot easier... Plus could help with getting your puppy used to having his paws touched. Bonus! I agree with most of the other posts. Booties/socks won't protect him from parvo, and are unneccesary in winter. Like others have said, if you are concerned about the pup walking in a certain area, pick it up! Teach the pup to allow you to handle its paws. Wipe it's paws if concerned about salt, and of course after walks in the rain/mud!! If it makes you feel better/safer for it to wear booties, I don't think it would hurt...just dont think it's necessary. Good luck! "Until one has loved an animal, a part of one's soul remains unawakened." That's really helpful, because I wasn't sure. I may be in a low disease area anyway, who knows? I think I might get them, but just for him to get used to them inside, he may never need real boots, but at least if he ever does then he wouldn't freak out. On walks though, I'll just be careful and bring puppy wipes (and hold him or keep him mostly inside). I live in an area where summer (coming soon) hits 90's, and sidewalk will be scorching - not sure how hot but too hot for me to walk barefoot for more than 10 feet. (And I live in the city - so lotta concrete to walk on before I can get to a park). By peak summer she will be 5 months..
We live smack dab in the middle of the city in Toronto so there is often more salt than snow. Pepper uses pawsh paws and I usually add mushers secret on top (as an extra layer on the bottom of the shoe). This seems to keep an extra layer of wax that absorbs into the leather and her feet stay dryer longer. I only would do this if there's been salt/sharp ice/slush combo around for a while. If its like the first snowfall, she just goes commando.